Senator Joni Ernst (R-IA) joined President Donald Trump at the White House, as he announced his directive to remove the outdated restriction on the sale of E15 year-round by expanding the Reid Vapor Pressure (RVP) waiver to fuel blends up to 15 percent ethanol throughout the year. “As the Renewable Fuel Standard is central to rural America’s growth and development, I want to thank President Trump, Secretary Perdue and Acting Administrator Wheeler for listening to the American farmer, and taking action to support rural communities. “As the nation’s leader in renewable fuels production, today’s action is especially exciting for Iowa. Granting the sale of E15 year-round will mean that Iowans will see an increase in farm income, increased ethanol production and consumption and a boost in our economy. E15 year-round also gives people across the country more choice at the pump. 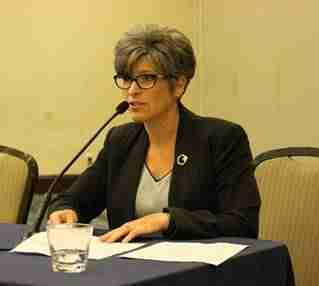 As EPA fulfills the president’s directive on reforming the Renewable Fuel Standard to better serve the American farmer, I look forward to working with EPA on their plans for increased transparency around the RIN marketplace,” said Senator Ernst. · Submitted comments to EPA Acting Administrator Wheeler on the proposed volume requirements under the RFS and urged the Agency to follow through on the President’s directive to remove the outdated restriction on the sale of E15 year-round. · Questioned a Council of Environmental Quality (CEQ) nominee about the importance of biofuels for rural communities and the need to uphold the RFS. · Pushed for year-round waiver for E15 in a letter to then EPA Administrator Scott Pruitt. · Penned a letter to EPA asking then Administrator Pruitt to examine the burdensome regulation that makes it more difficult to sell gasoline with ethanol content above ten percent, such as E15 year-round. · Awarded the 2018 Fueling Growth Award by Growth Energy for her work to advance renewable fuels like ethanol and to increase consumer choice at the pump. · Pushed for legislation that would remove unnecessary regulatory hurdles that keep E15 and higher blends of ethanol from being sold year-round across the country. · Questioned USDA Secretary Sonny Perdue on the agency’s efforts to protect the RFS and the 88,000 farms across Iowa and 50,000 jobs tied to the renewable fuels industry.